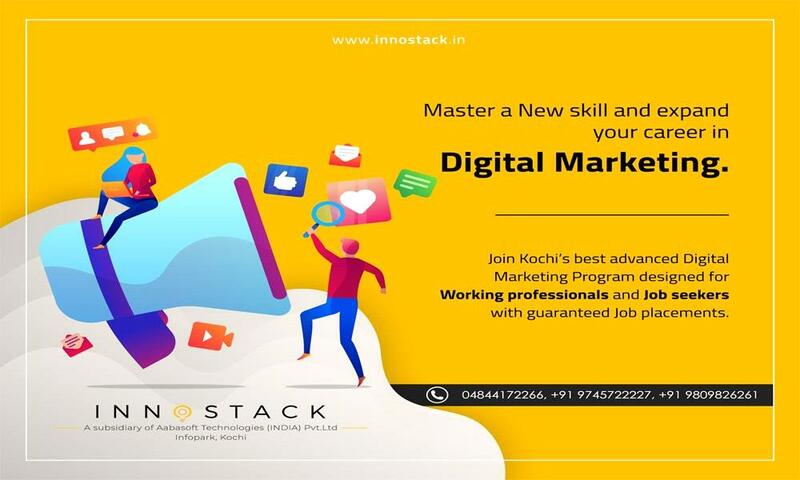 Digital Marketing Training and Internship will be held from 4th February to 4th May 2019 at Innostack, Kochi. Innostack is one of the best software training Centers in Kochi, offering technology training course with advanced internship programs for the students. Digital Marketing is leading the marketing function of businesses now a days opening doors to a whole new era of marketing. Digital Marketing allows marketers to reach and appeal to their targeted audience in brand-new ways with more precision. Master a new skill and expand your career in Digital Marketing with the help of Innostack. Aabasoft Internship process starts with a test at the corporate office based on the training happening at Innostack. To get eligible for an internship you should join for the training process in any of the technology available at innostack and prove your capability by scoring the cut off mark through an exam. Those who are crossing the test will be awarded a 1 month long FREE internship at infopark campus of Aabasoft.